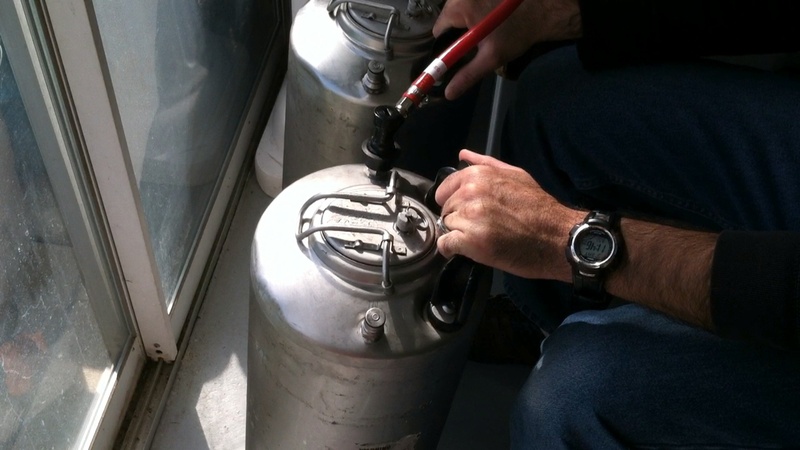 Here’s how to do a quick and easy force carbonation on your kegs. I learned this technique from Stan at Malty Dog Brewing, here in Michigan. It’s a fast and simple way to force carb and does a great job for most beers. This process will take about an hour and a half, and afterwards can be served right away. I like to let mine sit for a couple of days, for best results, not because of the force carbonation but because the beer usually has to cold condition anyways. Sometimes I’ll watch some TV or something as I do this to help pass the time. Excuse the video – I probably should have re-done the beginning! This will be a quick, easy way to do force carbonation. I learned this technique from Stan at Malty Dog Brewing. It’s a great, simple way and does a great job for most beers. That’s it – it can be served like that. I like to let it sit though for a few hours (minimum, but more like a few days to continue cold conditioning the beer). 1:45 The first thing I do is get the black connector off so I can connect it to the gas line. The reason being is that you can’t connect the gray connector to the beer out on your corny keg; you need the black one. I am a little over 20lbs, which is okay for two tanks because it will drop off dramatically. Now we connect it to the out on each tank and turn the gas on. 2:55 My timer is set to 15 minutes, I hit start, and gently rock both kegs at the same time. Nice and easy and slow. If I have a TV near I’ll watch something. Every once and a while you can hear the CO2 start to bubble. I’ve found that sometimes if you just rock the tank it doesn’t move the beer around a lot, so I sometimes try to go a little shorter with my movements so I can hear the beer moving around more. It seems to absorb more when I do it like that. 4:00 Now that my 15 minutes is up, I have to shut my gas off, disconnect it, and let it sit for an hour or so. 4:40 Now that my beer has been sitting for an hour and 15 minutes, the first thing I’m going to do is connect my gas lines back up to the “in” connector on the kegs, then reset to my serving pressure (around 6-8lbs). Next I release all the pressure from both kegs, and then turn the gas back on. 5:25 I have noticed a little leak in my cap on one of my kegs. To test for leaks I take a little bowl of water with some dish soap (like you would to check the gas connections on a barbeque grill), and put it around the seal where I think the leak is. If I see any bubbling that means there is a leak. I do have a little leak on top of one of my kegs, so after adjustment the leak is eliminated. 6:40 Technically it could be served now, but I’m going to let it sit a little longer so I have some time to clean my beer lines.